During today’s Ford Motor Company press conference at the Detroit Auto Show the company confirmed its five next new products while debuting the 2020 Ford Explorer. Among the five future products is the 2020 Bronco. The next-generation Ford Escape, F-Series Super Duty and Transit commercial van are three redesigned models up next in the Ford product pipeline. 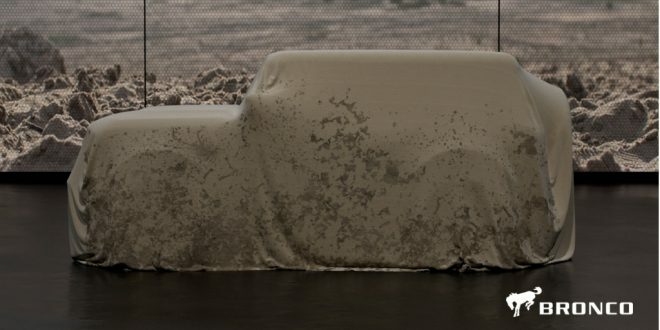 The all-new, much-anticipated Ford Bronco is one new product also in the pipeline for reveal. Lastly, the fifth new Ford product will be the Ford Mach E. The Mach E–originally named Mach 1–is going to be Ford’s battery-electric performance crossover. The model is expected to be based on the same platform as the Mustang and offer up to 300 miles of range per charge. Unsurprisingly, Ford has not offered any timelines for its next five new products. The 2020 Escape is expected to be revealed next, possibly as early as next month at the Chicago Auto Show. The new F-Series Super Duty will be later this year, likely in the third-quarter. The other three are still unknown at this time. At least a couple of years maybe for the Bronco. I await the new Escape to see if it will amount to anything.